The host was very helpful and nice. The location was perfect as it is in a walking distance from Piccadilly. The neighborhood was very peaceful and family friendly. We would recommend this apartment for sure. Excellent space for a large group of people! Lovely decor and close to the town centre. Perfect location! Amazing place to stay over with friends or family. Comfortable place with no problems. Very easy to get access to the building with no faults. Easy checkout too. Plenty of room for the lads , clean and a great location to walk or get a short Uber out . Decent apartment for a gathering of friends. Great location close the the Northern Quarter. Good lounge space and plenty of room to socialise. Lock in a great price for Penthouse Warehouse Slps 18 (61) - rated 8.8 by recent guests. 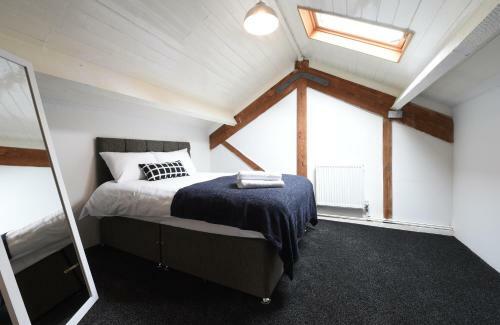 Set in Manchester, 900 yards from Greater Manchester Police Museum and 0.7 miles from Manchester Arena, Penthouse Warehouse Slps 18 (61) provides accommodation with amenities such as free WiFi and a flat-screen TV. The property is 0.9 miles from Chetam's Library. This apartment is equipped with a living room and a fully equipped kitchen. The property also has 1 bathroom with a hair dryer. Royal Exchange Theatre is 1.4 miles from the apartment, while John Rylands Library is 1.4 miles from the property. The nearest airport is Manchester Airport, 9.9 miles from the property. Penthouse Warehouse Slps 18 (61) has been welcoming Booking.com guests since 7 Dec 2017. When would you like to stay at Penthouse Warehouse Slps 18 (61)? House rules Penthouse Warehouse Slps 18 (61) takes special requests - add in the next step! Bedding didn’t have covers on for the pull out beds . No big bins for rubbish . The pictures of the apartment are deceptive as the apartment was very basic when we arrived we were shocked as to how basic it was. There was also a really strong smell of dampness in the kitchen and bathrooms. Photographs make the property look much better than it was. There was damp on the walls, broken equipment and the main door did not seem secure. A stable table would’ve been nice. Furnishings and internal finishes were pretty cheap. Only two toilets in a 16 person apartment and neither have extract fans.